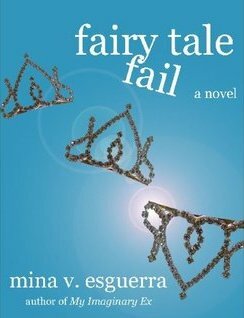 In my post asking for chick lit recommendations, Tina mentioned Fairy Tale Fail by Mina V. Esguerra. The premise was interesting and when I saw that it’s available in Smashwords for only $0.99, I went ahead and bought it. I felt like reading some chick lit so I started reading it and to my surprise, I ended up finishing the whole thing in just one sitting (note that I lost a couple of hours of sleep because of this). Looks like this week is turning out to be chick lit week for the blog! Even after her Prince Charming broke up with her, she just won’t give up … because fairy tale heroines don’t live “happily ever after” right away, silly, they’re tested first! Determined to pass the test, she spends the next year restoring herself to the girl Prince Charming had fallen in love with in the first place. Until she discovers that life without him might not be so bad after all: her career is taking off, her confidence is back, and the cute guy at work is no longer a stranger. So when is it okay to quit on a fairy tale? I always say that in order for me to like a book, I have to be able to relate to it somehow. No worries on that department when it comes to this one because I could TOTALLY relate to Ellie. Twenty-something Filipina working in a corporate job but really doesn’t know what her career path is? That could be me! Ellie’s thing is traveling and making plans for hypothetical trips abroad. While I do love to travel, I don’t get to do it that often so I guess it would be better to say that my thing is reading and blogging about books. I’ve never experienced an office romance like Ellie did but the breaking up with a boyfriend-who-was-a-friend-before-you-became-a-couple? Been there, done that. Ellie also has several circles of friends, from her high school barkada to her office mates and I’m like that as well. Each set of friends has a different personality and I like to think that each group brings out a different side of me. Ellie is really believable as a character – she’s a representation of me, my friends and every young Pinay out there looking for her own fairy tale. I keep my reviews spoiler-free so I don’t want to mention any names but I want a guy like the male protagonist! Seriously.♥ I thoroughly enjoyed reading about Ellie and her attempts to get her life back in order after the breakup. Fairy Tale Fail is a light and fun contemporary romance that gives a glimpse of middle class life in the Philippines. If only the paperback was as cheap as the e-book edition, I’d buy lots of copies and give them as Christmas gifts to my girlfriends. Unfortunately, the paperback is more expensive at P350. The good news is the e-book is available both in Smashwords and Amazon so for all international readers out there, you could order this anytime you want. If you want a peek at what our lives are usually like (and by us I mean young professionals in the Philippines), then go and read this book! At $0.99, it’s cheaper than your average Starbucks coffee. It’s really short too, more like a novella than a novel. I’m interested to see how readers outside the Philippines will react to this one. One minor quibble though, I wish Mina included footnotes to define some of the Filipino words used in the book like kuya, barkada and bulalo so that foreigners will be able to understand them. That said, I’d like to thank Mina for coming up with a well-written Filipino chick lit novel. 🙂 I look forward to reading her other book, My Imaginary Ex and I hope she comes up with a thicker novel next time. You liked it so much that you were able to finish it while sneaking in reading time on my Kindle during work hours. LOL, we’re such workaholics. NOT! Thank you for recommending this! 🙂 It was a quick read and I really liked it. I could really relate to Ellie and yes, I want my own Lucas. He’s not really a rocker, right? He just looks like one because of the tattoos and how he holds himself. Thank you! I like *that guy* too. Oh, I added a glossary of Filipino terms (of sorts) to the paperback edition, because I had to reformat it anyway. Admittedly, I underestimated the kind of audience the book would have. I guess a bunch of people would be willing to read Pinoy chick lit after all! is there a real life version of *that guy*? Oh there is! With fictionalized elements. But there’s always a real guy, hee. There is?! Can I meet him? Yes, I am aware that comment is bordering on stalker-ish. Hahaha. i also saw this book in goodreads… gusto ko rin basahin. Joy, go read it! I think you’ll really like it. 🙂 The ebook edition is really affordable. Haha sus, I have a lot of fictional crushes so you shouldn’t be surprised anymore when I mention things like that. I’m giving away a Chuck Palahniuk novel by next week. perhaps you might be interested to join. Hi Will, I’m not a Chuck Palahniuk fan so I won’t join your contest although I’ll link to it to let others know. 🙂 Advanced Happy Birthday! looovvveeee it! Thanks for letting me read it. haha. It’s very easy to read. Funny! I was so into reading that I was so oblivious to what you guys were talking about the whole time. I want my rockstar! haha! I can’t wait to read My Imaginary Ex tonight! Yay! Looks like you’re a Mina fan na rin 😛 It was so funny that you read the entire thing in one sitting! This was my first Mina V. Esguerra book and it made me want to read the rest of her work. Lucky for you, I have copies of all her books.